Bakson's Sunny Herbals Boro Calendula Talcum Powder Prevents & Relieves Prickly Heat & Itching Due To Excessive Perspiration. Prevents and relieves prickly heat & itching. Anti-bacterial, anti-fungal, anti-inflammatory and antiseptic action. 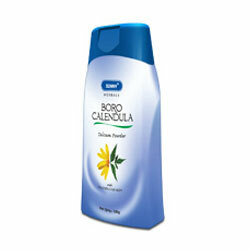 Talcum with an exotic fragrance and lingering freshness which keeps the body cool all day. It prevents and relieves prickly heat & itching due to excessive perspiration. Added benefit of Neem and Calendula which have anti-bacterial, anti-fungal, anti-inflammatory and antiseptic action on the skin, counter body odor and rashes keeping skin healthy. It is safe for babies. Use daily as required.